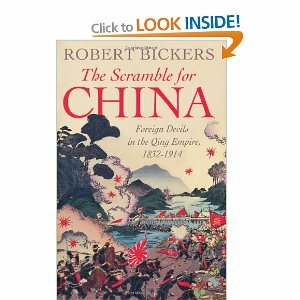 Charting a century of Sino-foreign interaction, confrontation and confusion,” The Scramble For China: Foreign Devils in the Qing Empire, 1832-1914 by Robert Bickers (Empire Made Me: An Englishman Adrift in Shanghai) takes readers on a journey deep into China’s “century of humiliation,” a time when decadent Manchu officials, unscrupulous capitalists, globetrotting imperial powers, would-be messiahs and revolutionaries came together, clashed incessantly, and nearly tore China apart. Beginning with the British literally breaking down the doors to a closed China, as Hugh Hamilton Lindsay of the East India Company forces his way into the offices of Shanghai Daotai in 1832, Robert Bickers traces the tumultuous, contentious relationship between Qing China and its “unwelcome guests,” a path that ultimately led to two devastating Opium Wars, costly and bloody rebellions, millions of lives lost, and left the door to China open for invasion by the Russians and Japanese. Bickers’ title owes much to Thomas Pakenham’s masterful history of European colonialism in Africa – The Scramble for Africa, however the extensive period of 82 years under analysis would suggest that there was less of a scramble than an infiltration. Certainly the extraordinary shift in land ownership that occurred in Africa was not replicated in China; here the western influence was less overt, but nonetheless pervasive. A fundamental mistrust and mutual contempt fueled successive conflicts between the weakening Manchu dynasty and western merchant adventurers. The ferocity of imperial invasion (the Japanese not least) has left an indelible mark upon the Chinese consciousness, and has engendered a burning desire never to be subject to any power again. Bickers manages to weave these events with the reality of modern China, and the role that awaits it on the world stage. China’s past affects not only its own present, but also the grace with which it will stride upon that stage. As Bickers writes: “In fact we cannot understand the resurgence of China now, and its sometimes quiet, sometimes raucous and foul-mouthed anger at the world, unless we understand the traumatic century which followed the first opium war, however much it might seem mere history. For mere history matters in modern China, and the past is unfinished business… “(10).